Michelle Berryman is a prominent user experience designer and information architect who has worked with interactive products and experiences since 1993. She is a highly sought-after speaker at design conferences globally and has presented at conferences in the U.S., Chile, Taiwan, Korea and Hong Kong. Michelle has spoken at the Consumer Electronics Show, The International Home and Housewares Show, and the Swedish Embassy. She has also participated as a speaker at the U.S. Patent and Trademark Office on the subject of Design Protection and Intellectual Property issues. Michelle has been very active with the Industrial Designers Society of America (IDSA) since 1993. She currently serves on the Board of Directors of IDSA where she holds the position of Immediate Past-President of the national organization. Michelle has recently been elected to the Board of Directors for the International Council of Societies of Industrial Design (Icsid). 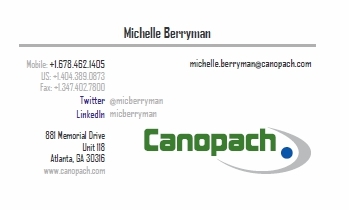 Michelle also maintains memberships with SIGCHI, UPA (Usability Professionals Association) and the Georgia Tech Business Network (GTBN). She is in her second term on the GTBN Board of Directors. Michelle lives in Atlanta with her husband Mason.